Kitchen equipment. Photo provided by CCLK. The Campus District has a new addition: the Cleveland Culinary Launch and Kitchen. The new establishment’s grand opening took place in September and proved to be a success with 350 people coming to check out the facility and to see what the Cleveland Culinary Launch is all about. The Cleveland Culinary Launch and Kitchen is a new type of business for this area of Cleveland. As Carolyn Priemer put it, “At its basic level it’s a shared facility, but it’s really much more for startup businesses.” The facility includes equipment that allows tenants to can, bake, cater, pack and label their products. Dry storage is available on site as well as two large walk in refrigerators and a walk in freezer. The facility is also secure: each tenant is given a key card that allows them to come and go as they please. With the industrial sized equipment that’s offered, the facility helps tenants boost production and meet the demands of a growing customer base. This can often be a problem for new businesses that may not have the equipment or the capital to invest in new equipment to keep up with demand. Priemer says the location of the Cleveland Culinary Launch and Kitchen “is key for our tenants…its really central for east, west and south,” which is also important. Along with industrial sized kitchen equipment, the Cleveland Culinary Launch and Kitchen also offers a Food Business Incubator program that works with people to help with the startup of their business and marketing and helps them navigate food regulations. Many of the tenants learn from one another and don’t hesitate to help each other out. The kitchen also collaborates with ECDI (Economic and Community Development Institute) to provide loans and business plans to the tenants. Furthermore, the Cleveland Culinary Launch and Kitchen provides its tenants with an address for their business and they have conference space where tenants can invite people for tastings or meetings. The kitchen recently held a successful two-week after-school program through Open Doors Academy that consisted of one week of cooking and one week of baking. The kitchen plans to offer more cooking classes this holiday season. 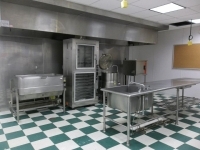 Students at Virginia Marti College will be using the facility for cooking classes. Overall, kitchen founders have seen a lot of interest in their business as well as successful growth and use of their facilities thus far. To find out more about the Cleveland Culinary Launch and Kitchen, visit www.cleculinarylaunch.com. Steven Zamiska is a student at Cleveland State University studying English.